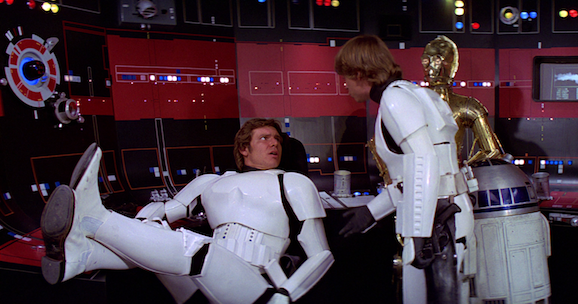 You probably remember the memorable sequence in A New Hope when Han, Luke, and the others head to the Death Star in order to rescue Princess Leia and mug some unsuspecting stormtroopers (seriously, is there any more incompetent military force in the galaxy?) for their armor so they can wander around incognito like. It’s a great piece of the film, and if this latest report is accurate, something similar could go down in Episode VII. We’ve seen concept designs of the new-jack stormtroopers from Episode VII, which have a sleek, less boxy design, and look like more modern incarnations of what we’re used to. Which makes sense, you expect this sort of thing to evolve over 30 years, and in general they have a much more sinister appearance. 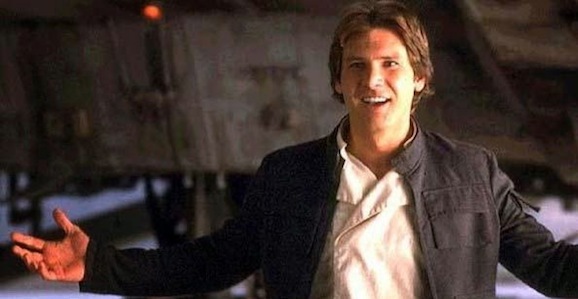 But according to TheForce.net, it sounds like Han may once again have to don this familiar disguise in order to go undercover and conceal his identity. There’s no word on why Han needs to cover up who he is and hide his, most likely, well known face (you don’t get to be one of the heroes of the rebellion and not have people know what you look like—after the Battle of Endor he was probably plastered all over the far, far away galaxy equivalent of a Wheaties box). If this does come to pass, let’s hope this kind of thing is kept to a healthy level. A certain amount of respect and appreciation for what came before is great and is a nice bow to all of the longtime fans out there, but too much is, well, too much. You saw them go way overboard in the prequels. If Disney, Lucasfilm, Abrams, and the rest really want to pay their respects to the beloved franchise, the best way is simply to make a good movie. References and in jokes and cute asides like this are fine, to an extent, but wouldn’t you rather see a strong story that captures the feel and aesthetic of original trilogy than a bunch of allusions? That’s a big reason why Star Wars Rebels works as well as it does, because when you watch it, it feels like you’re watching Star Wars. It has that energy and sense of adventure, and that’s what most of us are going to be looking for when Star Wars: Episode VII opens on December 18, 2015. Lets hope they don’t lose sight of that.